This story commenced in the heart of Janakpur where the decision to move forward with the concept of federalism initiated. Through a couple of prolonged protests Madhesi people gifted the centralized country of Nepal, the blessing of federalism. However, this only proved to be an agreement solely existent in papers and hence giving way to this unstoppable struggle in Madhesh. It is true that Madhesi people have been suppressed and deprived of most rights in the past and the trend is pretty much the same. The color of the skin, the imperfection of speech and the close relation to India was why Madhesi people were resented in the country by the general population. They were ignored and mislead upon attention. Now they are asking for an opportunity to rise which is yet again opposed by the leaders in power although it takes us to the extremities of human right violation. This is a picture from near Janakpur railway station. That person in the picture is a local technician who repairs people’s electrical appliances. Make no mistakes, there wasn’t any curfew at that moment and the area wasn’t put on alert by the police, yet you can clearly see the misuse of power and uniform. Let me share another video that clearly shows how Madhesis are being treated by the government as well as some of the security personnel to a personal level. One could only say that the Tikapur incident was bound to happen, however it will only be an inhuman behavior and the guilty should be punished. This was a local newspaper reporter trying to cover the story about Madhesi disapproval of the 1st draft of the Constitution of Nepal. Is Madhesi an ethnic group? According to Wikipedia “The Madhesi comprise a collection of different communities, and Madhesi people don’t represent a single ethnicity. Basically, people who live in the Terai region are Madhesis. So that is the answer for whoever says “jatiya wa sampradayik sanghiyata le desh bigrinchha”. Unlike what has been a popular trend on Facebook or twitter making Madhesi look like a caste, Madhesi are actually people who live in the southern plains of Nepal who want to develop their homelands as they see fit. 2. Are Madhesis trying to divide the country? There seems to be a general conception among people who have made themselves believe that Madhesi intentions are nothing but mere attempt to divide a country. 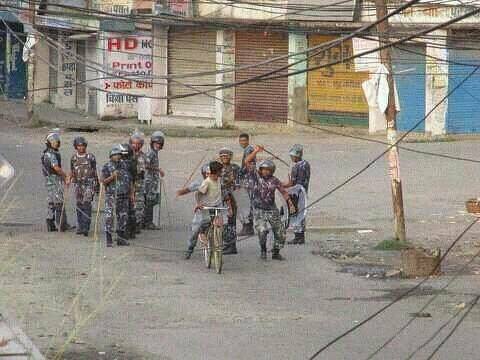 Let’s ask a question to ourselves; what possibly could Madhesi people gain by doing so? Obvious answer to this question would be, “to join India”, as that seems to be the general psychology of most. Is it supposed to mean that we will abandon our Nationality just because our culture and practices happen to match the people from across the border? I recently read an article where people from Sikkim were referred to as Nepalese while the same people don’t hesitate to call a dark, skinny guy from Terai; an Indian! These few people clearly show that they think of the word “Nepali” more like a caste than our nationality. So either you speak Nepali, also in a nice accent, or you are an Indian. So who is trying to divide the country now? 3. Are Madhesi really not willing to talk this out? Most people might argue that the government has been trying to talk matters out peacefully while Madhesi leaders don’t want to, and continue the protests. This is unlikely. Why would someone put thousands of life at stake and not talk issues out? Let me put it this way. I have a friend who wants me to join him in a cricket game. I ask “Do you have a bat?” No. “Do you have a ball?” No. “Do you know a place where we can play?” No. So why do you want me to come? How do they expect the leaders to agree to such a proposition and abandon those who have always stood beside? So I change my statement about Madhesi leaders being arrogant from unlikely to False! 4. Where is this going?